But while PoE ensures that VoIP phones are always available, the power draw on each PoE ethernet switch must be managed and analyzed to ensure efficient network performance. A review of the original PoE standards as well as PoE+ technology. An overview of how to solve power-related network issues. A look at where Power over Ethernet technologies is headed. 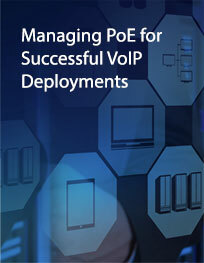 Fill out the form to download this white paper and gain an understanding of how to solve power-related network issues and ensure stable VoIP performance.